Engineered specifically for the Trident series, the Ocean Kayak Modular Fishing Pod (Mod Pod) allows anglers to mount, arrange and customize gear in a variety of positions within the Trident's cockpit. 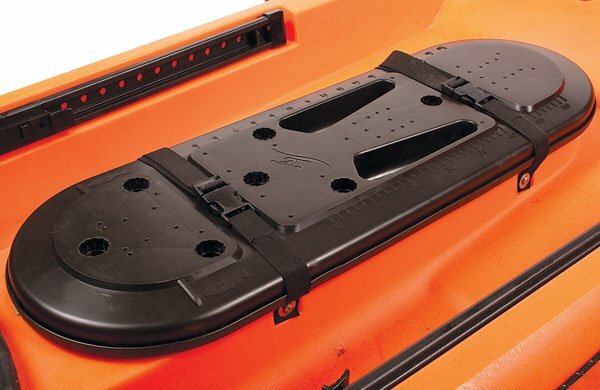 The Ocean Kayak Modular Fishing Pod includes seven uniquely positioned portals that can accept Scotty, Cannon rod holders and RAM mounts. In addition, a smartly laid out series of pilot screw holes enable anglers to mount GPS, fish finders, water bottle holders, paddle leashes and virtually any accessory to desired positions within the kayak. Standard equipment on the 2011 Ocean Kayak Trident series.